Statement necklaces have taken the fashion world by storm. From colorful jewels to chunky designs, a statement necklace can take an outfit from drab to fab. If you’re excited to rock some serious neckwear, but you’re not sure you know how to pull it off, we’re here to help! Check out this list of do’s and don’ts for wearing statement necklaces. Adding a bold necklace to your wardrobe can enhance even the most basic articles of clothing. In fact, the more basic, the better! Pairing a glitzy statement necklace with a simple T-shirt can do wonders, and effortlessly transition your outfit from day to night. In the words of Coco Chanel, “Simplicity is the keynote of all true elegance.” When you’re wearing a flashy statement necklace, avoid wearing chunky earrings or bangle bracelets. The size and bold design of your neckwear add enough elegance to your outfit without having to add more accessories. If you must wear other jewelry, try to keep it simple. Small stud earrings or a delicate bracelet are perfectly adequate. Since a statement necklace creates a focal point, it’s the perfect opportunity to express your personal style. Try different designs and color combinations when you’re shopping for a statement necklace, as you never know what you’ll discover about yourself until you try different styles. Try layering a couple of necklaces together to make an even bigger statement. A great combination to try is a smaller necklace with a statement piece to give some balance. For even more attention and depth, pair two chunky necklaces together. It doesn’t matter how many trendy pieces or styles you’re wearing, if you’re not comfortable with it, it won’t feel stylish. Put a personal twist on every trend you incorporate into your wardrobe to feel like a true fashionista. Be sure to check out our guide on choosing the best necklace for your neckline. What does your favorite statement necklace look like? 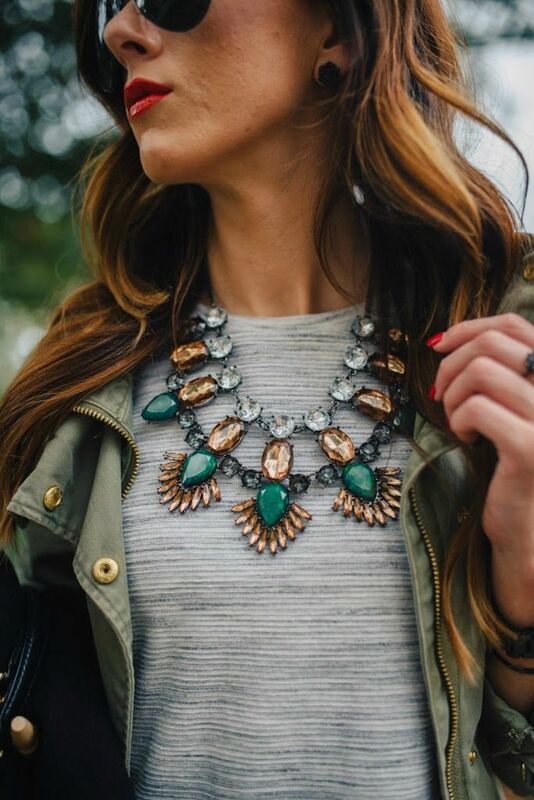 What are your best tips on how to wear a statement necklace? Share your favorites on social media, and don’t forget to tag Shop LC!